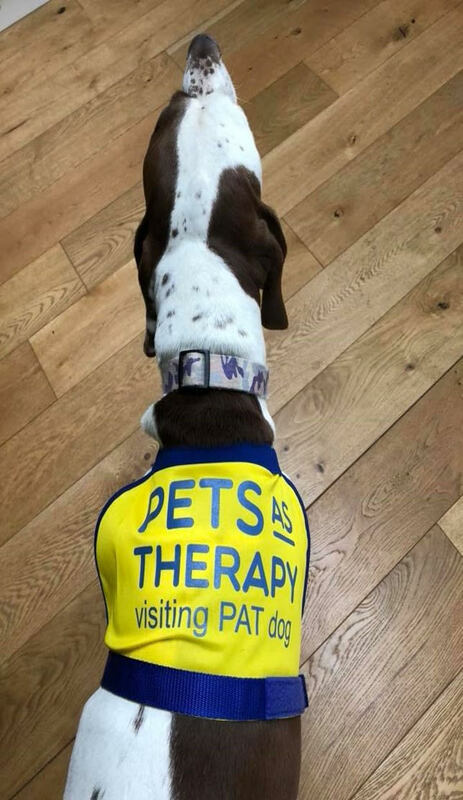 Thousands of people of all ages benefit every week from the visits provided by Volunteer PAT Teams, and various other charities and organisations, they visit residential homes, hospitals, hospices, schools, day care centres and prisons. 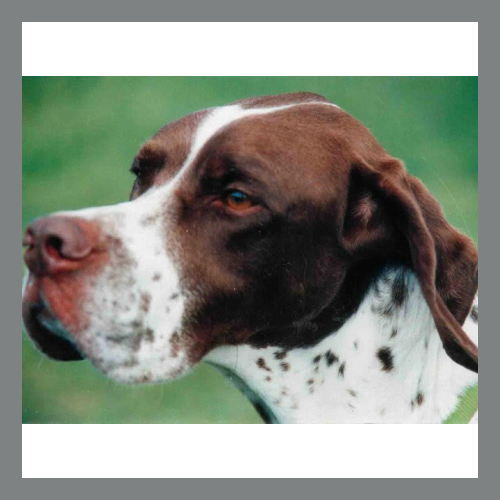 There are several Pointer owners who take their Pointers along. 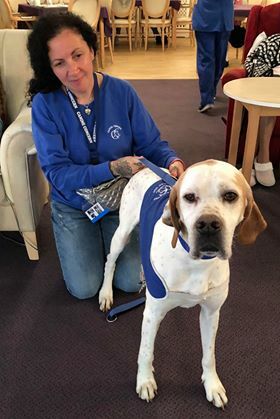 Volunteers with just a small amount of spare time each week work with their own pets, to bring joy, comfort and companionship to many individuals who appreciate being able to touch and stroke a friendly animal. We would love to showcase some of the beautiful stories and photos of your pets, please contact me at lyndarayner@gmail.com and share your experiences of this worthy cause. 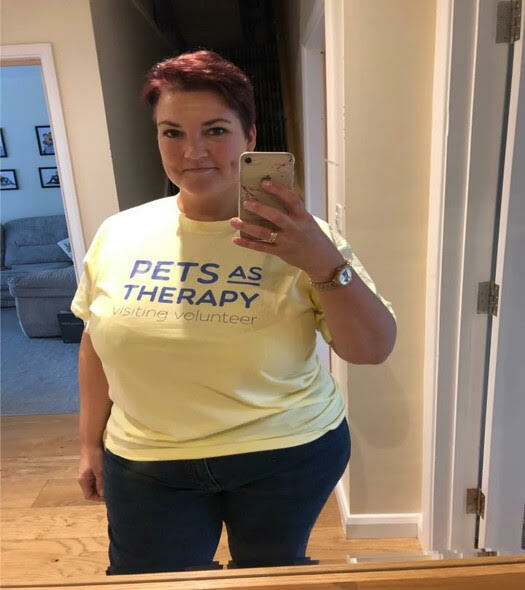 I started with Elle being a PAT dog. We still go to the same care home for people with dementia, plus another home and palliative care day centre and St Giles hospice. 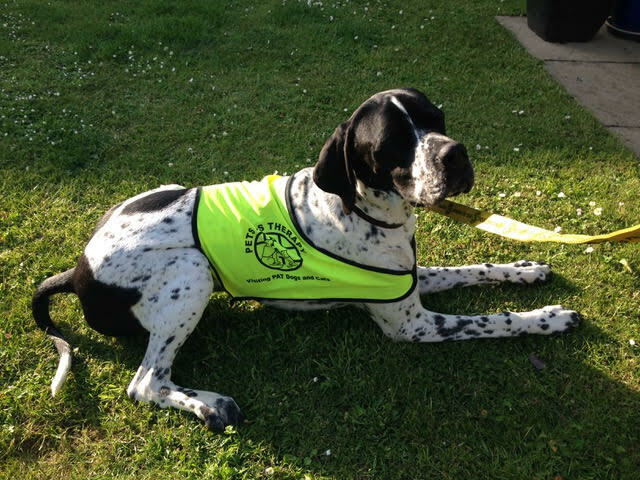 We represent Canine Concern, a Smaller charity than Pat Dogs, but do the same work. 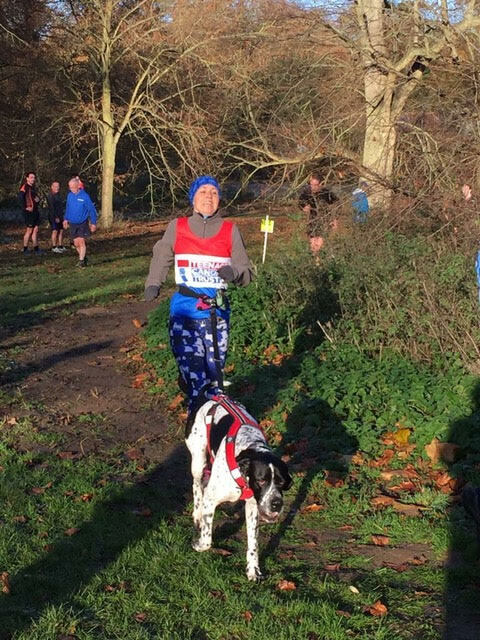 We are going to be on the Kennel Club stand at Crufts 2019, to represent the charity . 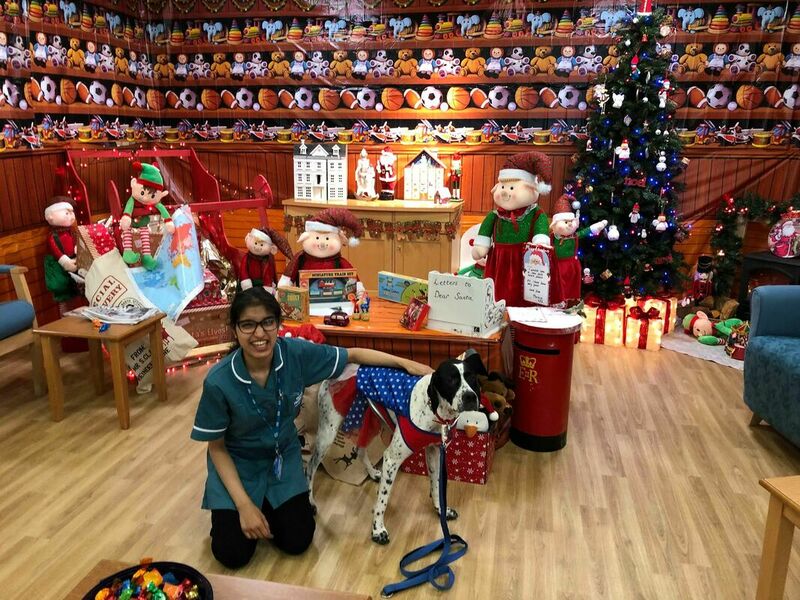 My daughter- in- law takes Stella to a special school and also a care home. 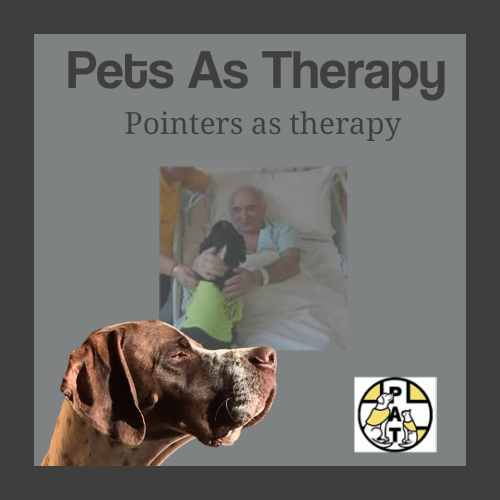 Pointers make excellent care dogs as they are so sensitive and attuned to people. 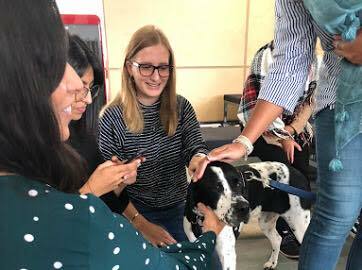 Stella and Panda were recently mobbed when we were doing a fund raising day in a Birmingham Business Centre. The girls got few hundred pounds donation. They worked so hard all day. Even when they had a break at lunch, people kept coming to see them and when I took them outside people stopped us in the street as they were in uniform. I actually have a wardrobe just for their collars and costumes and accessories that they wear. 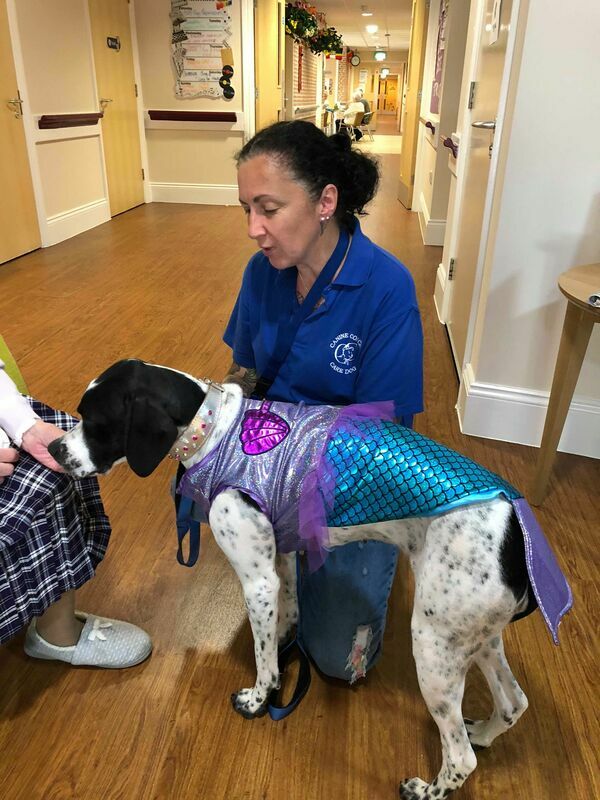 It cheers residents up when they dress up. Gives them something to tell their visitors. Stella is a rescue, bless her. Hannah told me last Friday that she had a new group of children. One kept running away frightened, but by the end of the session was lying on the dog bed with Stella holding her lead. One lady always calls out all their names, and asks after the ones that are missing. She even remembers my beautiful Elle. 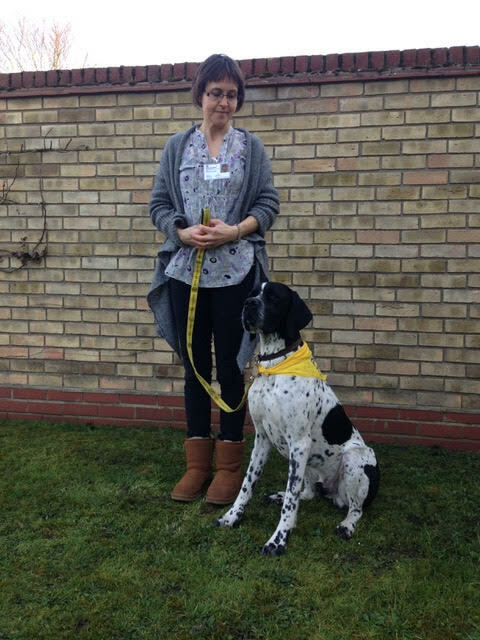 Panda has comforted grieving families in the hospice. Its never too young to introduce this wonderful breed to the cause either. Hendrix is the latest 'trainee', he is just 7 Months old, and he instictively knows to be gentle with the children and other people. 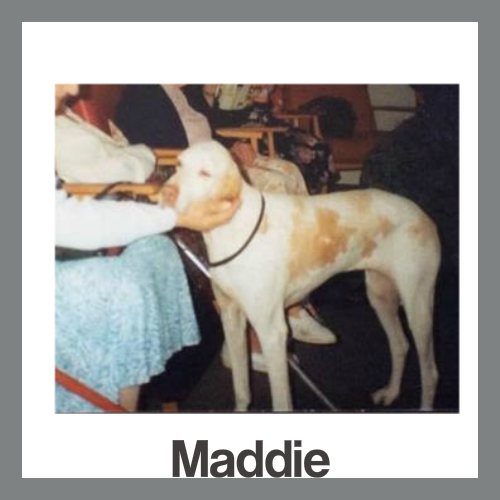 When we lived in St. Ives over the years we had three PAT-Dogs, Border, Maddie and Missie. There were many lovely moments but I can think of three which brought me so close to tears, strangely all concerning Border, our liver/white boy. We visited the Old Folks Home weekly and one morning when I arrived one of the carers asked me if I would take Border over to a lady who had been crying all morning and they couldn't get her to tell them why. When I went over she was sitting in her chair breaking her heart. 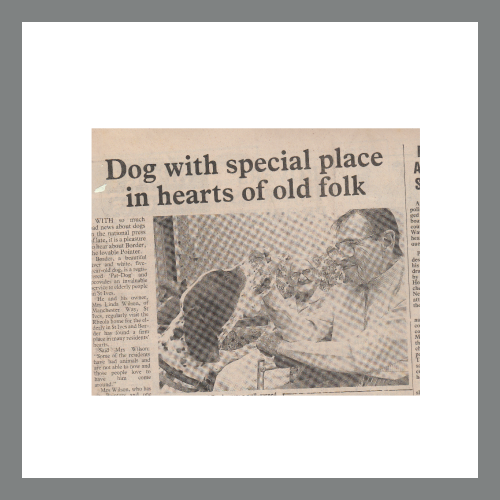 Border pushed his muzzle into her hands and the crying stopped instantly. She immediately took his head in her hands and started talking to him. I have no idea what she was talking about but it didn't matter, she had stopped crying and maybe she was telling him what it was all about, who knows? Another morning I was asked to take him to a lady's room as she wasn't expected to be able to leave her bed again, and she really loved Border. 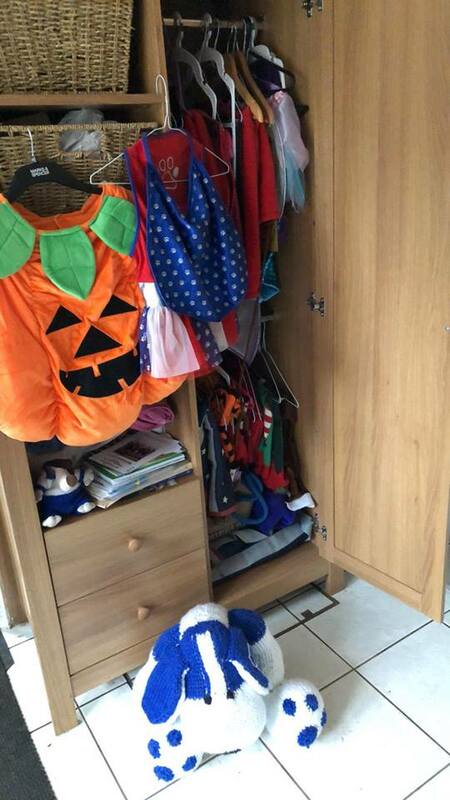 I went into the room and got quite a shock as I really thought she was dead. Anyway Border put his head on her lap by her hands and I just heard her whisper Border, and she smiled. When I went back the next week I was told she had died that afternoon that Border had visited. The third thing was when I left the old lady's room and was walking along the corridor with one of the carers who loved Border. She told me that she was terrified of dogs. I was stunned because she always made such a fuss of Border. She said she was never afraid of him as he was such a kindly and gentle dog. How I stopped myself from crying in these three instances I will never know. 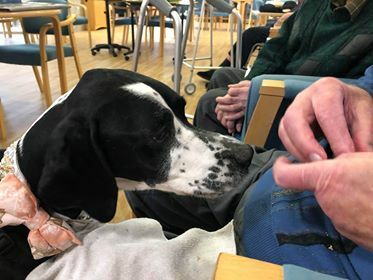 Visiting with a PAT-Dog is such a worthwhile thing to do, and Pointers are so good at it. You do have to be committed though because if you are visiting weekly they do expect you to be there and may well have spent the week looking forward to the next visit. ​Basil (Meadowpoint Spirit of Dance) was bred by Danielle Dunn. 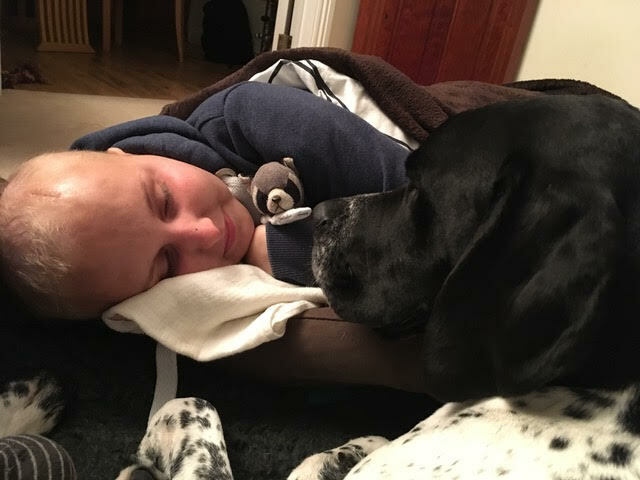 Having had a previous pointer, who turned out to be such a great temperament as a Therapy Dog we were so happy that Basil has shown to be an equally good therapy dog and in many ways ever more resilient - we call him bomb proof as he doesn’t flinch at alarms, metal doors, locks and children’s screeching. This has led to him visiting a local care home, prison, primary school, hospital and even a pub/hotel to help with a group that supports people with Aphasia (speech and language difficulties following stroke and brain injury.) 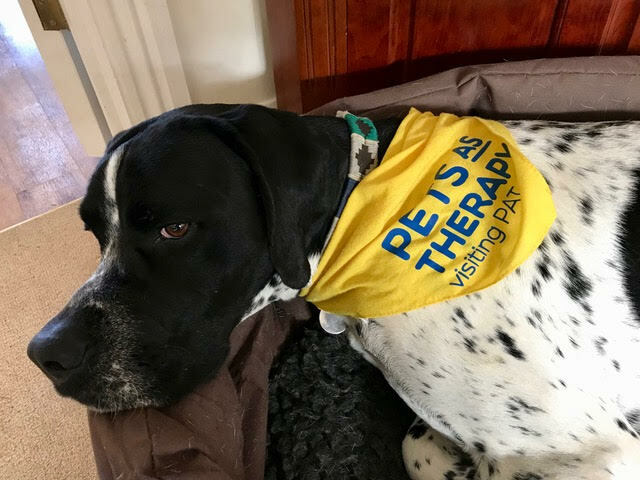 Basil knows what is expected from him when he puts on his PAT bandana and seems to switch into therapy mode. 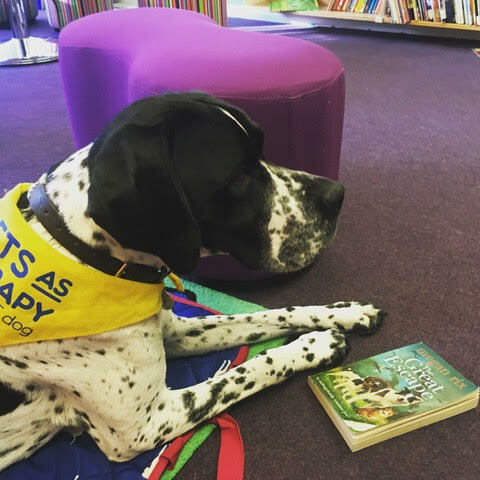 Basil’s work in primary school is to help youngsters with their reading (Read2dogs) and also extends to confidence building for anxious children. 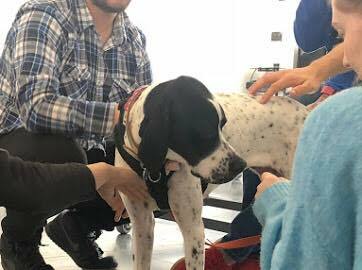 He is a non judgemental comforting listener whom the children can have one to one time with - they might lie on the floor with their arms wrapped around him to read or sit next to him just reaching to stroke his velvet ears. He can be a talking point to help relax a child and a distraction when he unexpectedly breaks wind! 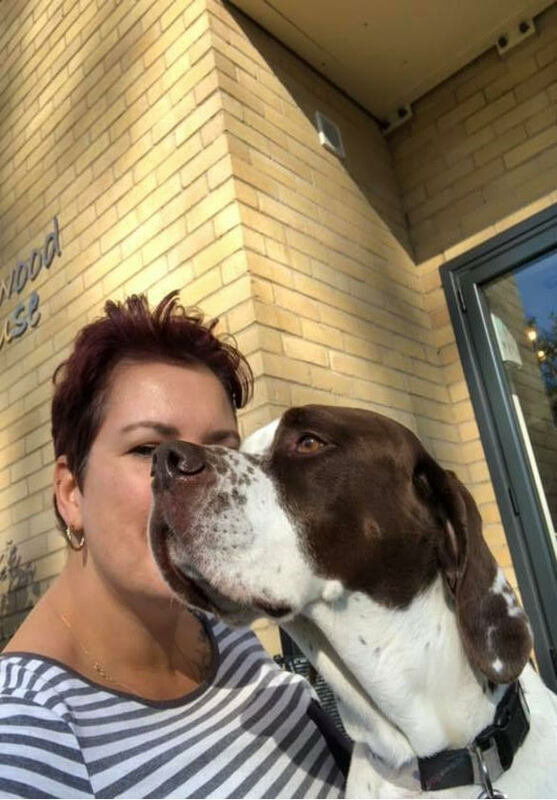 We meet with Danielle, his breeder, whenever visiting family in Yorkshire and are so grateful for a beautifully bred Pointer who brings so much happiness to not only us as a family but many more.